With 6 customizable settings, you can have personalized coffee settings for each member of the family with this Saeco Xelsis super automatic coffee maker. 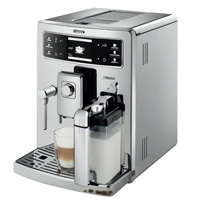 We were impressed with the design of the machine and specifically its touch interface that makes it simple to order a latte or a cappuccino with one press of a finger. The steaming wand is another handy feature, producing extra-hot drinks with its dedicated boiler. While this is a large and quite expensive machine at $2,993.30, its fast controls and microfoam capabilities make this model stand apart from the rest.